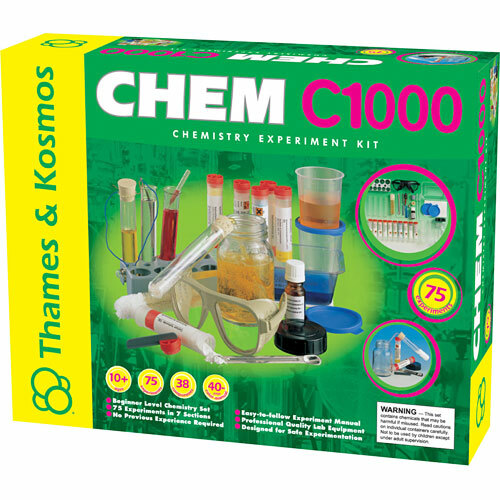 Enroll in CHEM C1000 and prepare yourself for a lifetime of fascination with this essential science through 75 diverse experiments. Build a mini fire extinguisher and make water flow uphill in experiments with air pressure. Float a soap-powered boat to learn about the surface tension of water. Entertain your friends and family with chemistry "magic" tricks, and then enlighten them with the scientific explanations behind the magic. Identify the elements in different chemical substances with dazzling colors in flame tests. Learn how to use certain chemicals reactions to paint an American Flag that appears out of nowhere. It may seem like magic to observers, but you will know the explanations behind the magic. Discover how you can get electricity from a test tube in electrochemical reactions. Use invisible inks to write a secret message. Test the inks from your colored markers on the chromatography racetrack to reveal their different color components. Begin to build a strong foundation in chemistry with exposure to a broad range of chemical phenomena and hands-on laboratory experience. 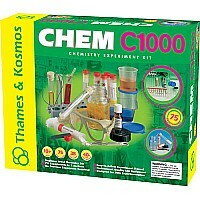 Professor Probenius is your chemistry professor for CHEM C1000. He provides clear instructions for preparing and performing the experiments, offers safety advice, gives explanations for the observed occurrences, and asks and answers questions about the results. Thorough safety precautions and instructions ensure safe experimentation. 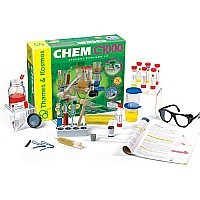 Professional quality equipment helps you make the most of your chemistry experiments. The 40-page, full-color Experiment Manual guides aspiring young chemists, chemical engineers, lab technicians and researchers through the 75 experiments. Measures approximately: 16.50 x 4.20 x 13.00 inches..